They say the city of Rome wasn’t build in a day, but your city can be in about 30 to 60 minutes! 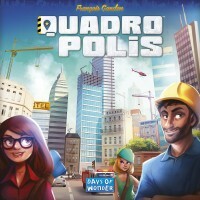 In Quadropolis players take turns choosing tiles to take from the central construction site and build them into their own city, this is done by placing their Architects on a row or line and this is where the luck comes into play, unless you are going first, you are going to be limited by what choices can be made as you are not able to place your Architect in the same space, nor can you point to the previously taken tile. While the game of Quadropolis is lightweight to say the least, the game rewards players for thinking ahead and fully understanding how the scoring of the game works. The placement of tiles is vital and all the different types of tiles require different configurations to score the most points, once you understand this, you are in a better position to critically assess the options available to you. The game comes with 2 game modes, classic and expert. While the expert version of the game adds another round and brings in a slight increase in complexity, the game is very light and should be enjoyed by many non games. This is a great gateway game that introduces placers to the idea of set collection and tile placement. This game is a fantastic gateway game that will have players coming back time and time again. You may not have back to back sessions but this game certainly wont be collecting dust on the shelf. Days of Wonder are a fantastic publisher and this game is another testament to that. All the pieces in Quadropolis are either thick card tiles or plastic pawns and other tokens. Opening this up really cemented in my mind that I was going to like this game (sorry, spoiler). While the game could be held up by its mechanics alone, the quality in the box adds so much that make it so much more impressive. The game is quite easy to pick up, that being said it is suggested by the instruction booklet that you run through the classic version of the game before trying it out in expert and I have to say I strongly agree with this. However once you have played the expert version you may not want to head back to the classic version. Like many other 2-4 player games the scaling of the game works wonderfully. In Quadropolis no matter how many players, a round is set up initially in the same way, tiles are taken out of the bag and placed faced down on the construction site, it is only then that the tiles are flipped face up, but only those corresponding to the player count of the game. The theme is pretty light here, you are building a city and moving people around. It’s no Eldrich Horror or Above and Below but it definitely comes through in the gameplay, you certainly feel like a mayor or city planner putting together you quaint little city. Ok so Quadropolis isn’t going to appeal to everyone in your game group but this is a perfect edition to your collection of gateway games. This is a great game to bring out at your next family gathering or when you are wanting something lighter and you have played the life out of Takenoko and King of Tokyo. If you are looking for a fun family game with wonderful components, look no further than Quadropolis! To build your city, use your own four architects, numbered from 1 to 4, to take a tile from a 5 × 5 construction site; by example to take the fourth tile in a row, you may use architect 4 from top or 2 from bottom; choose wisely: tile can only be inserted in the city in the fourth, or second, quarter. You get also population or energy as indicated in the tile; they are requested to activate buildings, no activation no final points, and who gets the best score wins; one point less for each unused citizen or energy. If you play in the expert mode the quarters are five so the architects are numbered from 1 to 5, additionally you don’t have your architects’ team, but there is a common pool: where there is one architect of each number per player; there are also two new types of buildings. Few well written rules in a colored fancy rulebook; examples given help to clear any doubt on the game. Easy and challenging, you can choose the level according the gaming experience of the players; at classic mode could be considered as family game, but take in mind that, even if it is mainly tactical, a level of planning is necessary to pose properly the tiles in your city and to use energies and citizens. The interaction is at indirect level but it could be tough, in fact you must pose a common pawn, called urbanist, that does not allow the next player to you to takes tile from the same row and column where you take your one. It’s funny and it lasts the right time for the mind effort required; it has a little bit of innovation in the mechanism of taking tile and expansions are available; a solid 8/10. Add a Review for "Quadropolis"